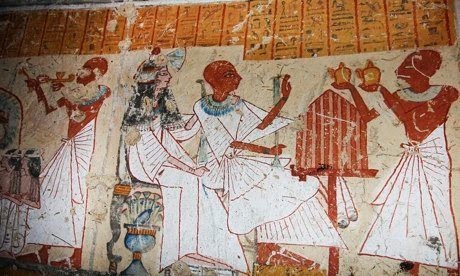 World Archeology: Japanese archaeologists discover 3,000-year-old tomb with vivid murals in Egypt. 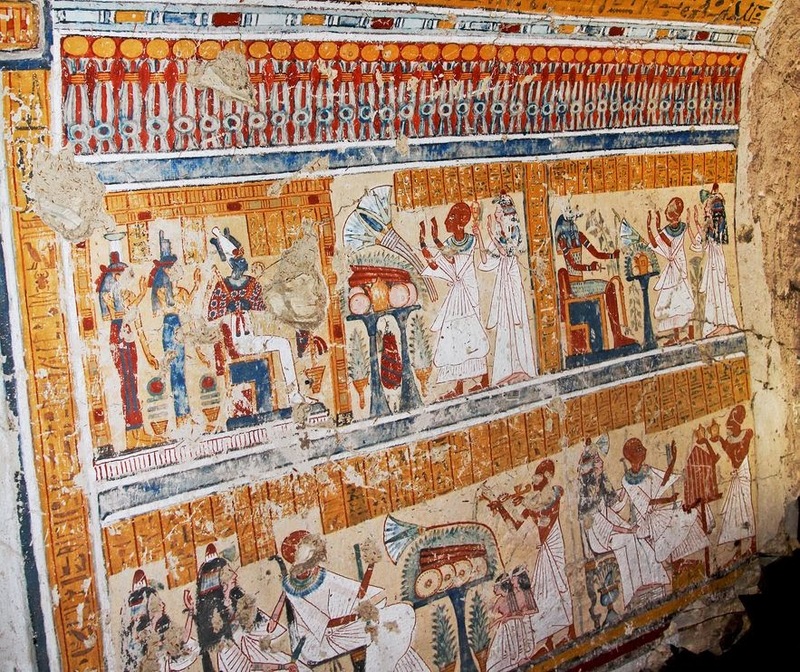 Japanese archaeologists discover 3,000-year-old tomb with vivid murals in Egypt. Japanese archaeologists have unearthed a near-pristine tomb of a high-ranking Egyptian official who served as a temple's chief brewer 3,000 years ago. The site, on the west bank of the Nile near Luxor, dates from the 12th century B.C. and has beautifully preserved murals in vivid colors. Jiro Kondo, who led the dig on behalf of Waseda University’s Institute of Egyptology in Tokyo, said, "In recent years, it has become extremely rare to discover a tomb with paintings on the walls and ceiling that remain in such a good condition." The site is part of a necropolis that contains 1,000 or so grotto tombs that were first excavated nearly 200 years ago. Only a few dozen of the tombs have such well-preserved murals. The university's Institute of Egyptology has been searching for tombs of ranking officials in the New Kingdom period (between the 16th century B.C. and the 11th century B.C.) since 2007. The tomb's owner was identified as Khonsuemheb, who oversaw offerings of beer and foods to the temple of Mut. The tomb contains images of him as well as his wife and daughter. The chamber is about 2 meters wide and 5 meters long. Its actual height has yet to be determined due to a buildup of sand. Aside from paintings on the walls, the ceiling is emblazoned with images of Khonsuemheb's funerary procession and the couple at prayers. The researchers said the paintings provide new insight into the way tombs at that time were constructed as well as details on the how funeral services were conducted. They also found a pit inside the tomb that they believe leads to the burial chamber. They hope to uncover the sarcophagus and excavate the mummy during their next expedition. The find came after the discovery of a separate tomb last December, which also had colorful paintings.